This experiment demonstrates how a T1 data communications code can be viewed by the ADC-200/20 oscilloscope and how a simple circuit can alter the code to recover the embedded clock signal. The figure below illustrates various baseband data codes and their respective frequency spectra. The T1 signal is the Bipolar AMI RZ. What a very popular serial data communications signal looks like. What the frequency spectrum of that signal looks like. A simple circuit to extract the embedded clock signal in the data for signal regeneration purposes. College or University Data Communications Course. 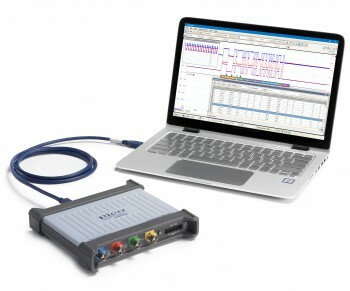 ADC-200/20 oscilloscope running PicoScope oscilloscope software. T1 Test Generator. Wandel & Goltermann DSA15. Coaxial cable with BNC T Connector terminated in 100 ohms. Always keep in mind that the ground of the ADC-200/20 is common to the ground of the PC and thus common to AC ground. Using the correct bantam test cord, connect the T1 test set output directly to the Ch1 input on the ADC-200/20. A coaxial cable with alligator clips can be used to connect to the tip and ring on the balanced bantam cable. Ensure that the Ch1 input is terminated in the correct T1 impedance of 100 ohms. The spectrum of the QRSS signal is shown in the first figure. It is a smooth hump with very little energy at DC, peak at 772 kHz, and null at the bit rate of 1.544 MHz. The spectral capture on the ADC-200/20 is shown below. In order for a digital signal to be useful, it must be periodically regenerated to remove unwanted noise. To do this, a clock signal must be present at the data rate for sampling purposes. In order to do this, the T1 signal can simply be put into a full wave diode bridge. 4 ordinary diodes like 1N914 diodes can be used for this purpose as shown below. Connect the T1 test set with alligator clips so that the signal is at the AC points of the bridge. The ADC-200/20 tip will connect to the positive of the bridge and the ring to the negative. The T1 signal is now rectified and the capture is shown below. The spectrum of the rectified T1 signal now shows a strong recovered clock at the bit rate of 1.544 MHz! This experiment was written by Jeremy Clark and Kyle James Mcneil at Seneca College, Canada.